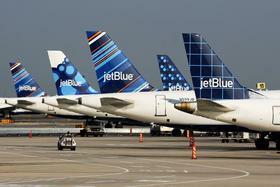 JetBlue will offer daily non-stop service from Rochester to Boston. That according to New York Senator Chuck Schumer who says the roundtrip flights from the Greater Rochester International Airport to Logan International in Boston will fly once per day and the service is expected to being on January 8. Schumer says that right now, the only airline that flies from Rochester direct to Boston is American Airlines. He says adding JetBlue can help keep ticket prices affordable. Schumer says he has pushed for the new route in numerous conversations with JetBlue officials. He says that the new route fulfills JetBlue’s commitment of flying from all Upstate NY airports direct to Boston with Buffalo, Syracuse and now Rochester all offering flights. Monroe County Executive Cheryl Dinolfo says the new JetBlue flight is on an Embraer E-190, which is a 100 seat aircraft.